Gregor Reisch, Logic presents its main themes. Margarita Philosophica, 1503 or 1508 (?). Two dogs named veritas (truth) and falsitas (falsehood) chase a rabbit called problema. 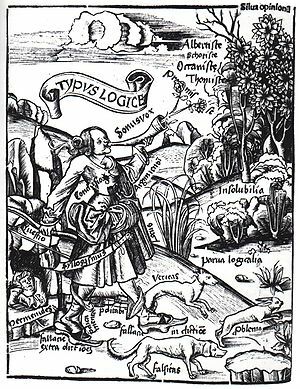 Logic runs behind the dogs, armed with the sword syllogismus. In the bottom left corner, Parmenides can be seen in a cave. Parmenides was one of the people who introduced logic into philosophy. Logic, reasoning ke vigyan hae. Ii panna ke 8 March 2013, ke 20:28 baje, pichhla time badla gais rahaa.